C. Culpepper, 11, M, GA.
Columbus Culpepper and Jane Register on 16 Mar 1879 in Laurens Co., GA, Bk J-77. ED 84, sheet 12, line 86. Sarah D. Culpepper, Daughter, F, S, 9/12 (Sep 1879), GA/GA/GA. Lillie Culpepper, Dau, F, 1893, 7, S, GA/GA/GA. Ebinosier Culpepper, d. 19 Feb 1924 in Laurens Co., GA.
Lillian Culpepper, Dau, F, 16, Sng, GA/GA/GA. J. L. Culpepper and Miss Lola Floyd on 31 Oct 1920 in Laurens Co., GA, Book P-361. His tombstone says "Co. A, 57th GA Infantry". Private John S. Culpepper of Captain Bryan's company of the 2nd regiment of the Georgia Army, was enlisted by __ McConnel of the 1st regiment of the GA Army at Camp Harrison on the 12th day of October 1861 to serve six months. He was born in Laurens Co. in the state of GA, is 29 years of age, 6 feet, 2 inches high, fair complexion, gray eyes, light hair, and by occupation when enlisted, overseer. During the last two monthe said soldier has been unfit for duty 61 days by reason of sickness, the origin of which is unknown to me. /s/ Lucius C. Bryan, Captain Commanding Company, Jany 17, 1862. I certify that I have carefully examined the said John S. Culpepper of Captian Bryan's company and find him incapabale of performing the duties of a soldier because of organic disease of the ventricles of the heart (ossification) which disease incapacitates him from performing the duties of soldier and in my opinion he will be unfit during enlistment. Hence, recommend his discharge. /s/ Jany 17, 1862. (illegible name), Surgeon of the 1st Brigade of the GA Army. Let the discharge be granted, by order of Maj Gen Henry R. Jackson. + Dorothy S. Culpepper, 25 Sep 1837 – 13 Nov 1909. John S. Culpepper and Dorothy Chastain on 31 May 1860 in Thomas Co., GA, Book H-123. Sarah C. Culpepper, 1, F, GA.
+ Julius G. Culpepper, 27 May 1874 – 17 Dec 1935. Kate B. Culpepper, Dau, S, Female, W, 3, GA/GA/GA. Calvin Culpepper, Son, M, Feb 1900, 3/12, S, FL/GA/AL. William Henry Culpepper, b. 9 Sep 1893, White, Houston Co. AL, Jackson Co., FL. John Christopher Culpepper, b. 29 Oct 1895, White, Decatur Co. GA, Jackson Co., FL. 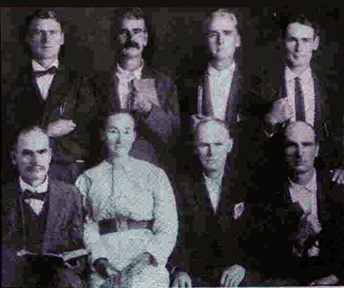 John C. Culpepper and Mattie Hall married on 1 Jun 1902 in Jackson Co., FL, Book 4-490. James W. Culpepper, Son, M, S, W, 1, At Home, FL/GA/GA. Mary J. Culpepper, Sister, F, 40, S, GA/GA/GA. Glenn C. Culpepper, Roomer, M, Wh, 36, sng, AL/AL/AL, City Clerk, Vet=WW. Glenn C. Culpepper died 13 Jun 1941 in Jefferson Co., Alabama. Donald Culpepper, Son, M, 1 7/12, S, GA/GA/GA. Obituary of Dr. William Donald Culpepper (#3753), published 2 Jun 2010. Lee R. Culpepper, d. 25 Aug 1979 at 85 years in Dougherty Co., GA; Res. in Dougherty Co., GA.
William A. Culpepper, Lodger, M, Wh, 21, sng, AL/AL/AL, Collector/Gas Electric Co.
Constance T. Culpepper, Wife, F, 31, M, md@28, MO/MO/MO, Not emp. Warren W. Culpepper, Son, M, 1, CO/AL/MO. Rocky Mountain News, Denver, CO.
Obituary of Constance Haldeman Culpepper (#3741), published 18 Jan 1997. Obituary of Warren Culpepper, published in Denver Post on Jan. 18, 2017.